AOL is readying a reader to fill a void left behind by Google. Google announced in March that it would retire Google Reader on July 1. Urs Hölzle, senior vice president of technical infrastructure and Google Fellow, wrote instructions in a post on how to export their data using Google Takeout. 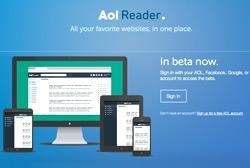 Now in beta, reports expect the launch of AOL Reader for Monday. The site doesn't easily render in Chrome; users should try Firefox or Explorer. AOL isn't the only company with plans for a reader. Reports come as Digg and Facebook reportedly are separately working and experimenting with readers of their own. RSS feeds, which could make a comeback after disappearing for years, would offer real-time support for breaking news on smaller mobile devices. Think of the feed as a precursor to Twitter. It acts similar, but users would pull in content through push technology from across the Web, rather than across an app. Preset requirements would work based on geolocation to get local news, weather and more. Tie in ads for brands, and there's something for everyone. Other readers have been making a play for Google users. Feedly.com, which recently launched, provides a way on its home page to import Google Reader information.